Vac's No Bow/Quick Wrap/Cold Water Wrap Set of 2. Vac's No Bow/Quick Wrap/Cold Water Combo Wrap - With newly designed hook & loop panels, no bandage is needed over this NEW one piece No Bow Combo Wrap. Under this Combo Wrap is Vac's Brand No Bow Wraps -- the best No Bow Wraps in the world for over 30 years. These wraps go on fast and easy for a snug adjustable fit, perfect for stall or shipping. Works for large stables looking to save time and money. Works for the young rider not sure how to wrap a horse. And for the horse that "chews up the bandages", Vac's new hook and loop panels will keep the wrap on. 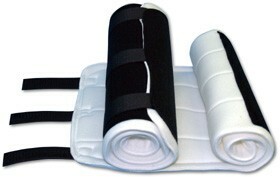 This product makes an excellent, fast, and economical Cold Water Wrap as well - absorbs perfectly and is easy to apply. This item is available in Black only. Available sizes are 12 inch, 14 inch, and 16 inch. Sold in pairs.